Our company is looked upon as one of the major Automatic Cooling Bed Manufacturers in India. The Cooling Bed, offered by us, is widely demanded in the market due to the unmatched quality and unsurpassable performance in respective applications. Kathuria Rollmill Private Limited is the Manufacturer and Supplier of Cooling Bed. "W" Channel Type Cooling Beds Kick off Type cooling beds. 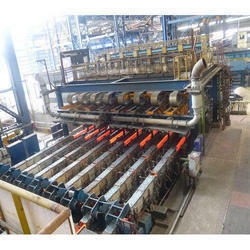 Automatic Rack Type Cooling Beds for TMT Bars.